When the weather dips and appetites spike to those of sled dogs, nothing cures the winter chills better than a slow-cooked soup. But what is this bouquet garni which makes an appearance in so many French recipes for soups and stews? It is as simple as a handful of herbs (thyme, parsley, bay leaves, sage, etc) tied together with a string. Thrown into a soup or stock, it infuses the broth while leaving very little leaves behind. And for my sensitive herbaphobic other half, a tea infuser stuffed with aromatics does the trick without leaving behind a trace. 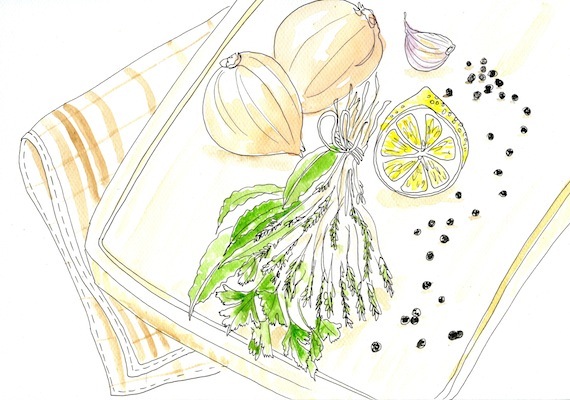 Posted in IllustrationTagged bouquet garni, France, healthy cooking, illustrated food blog, what is a bouquet garni?